The E Myth Manager CDs by Michael Gerber – Discount! Don’t Just Manage … Lead the Way! As a manager, you face growing pressures to improve productivity, decrease expenses, and motivate employees. Being a leader in today’s work force has never been tougher. Virtually all managers make mistakes along the way, including working harder, working longer, and demanding more from their employees. If you ever dreamed of accomplishing twice as much, twice as fast, and with half the budget, it’s time you discovered the remarkable secret of today’s top managers. Even the best managers need a little help now and then. 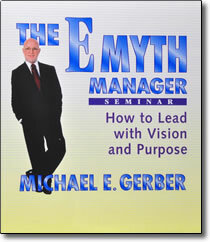 The E-Myth Manager Seminar will support your goal to lead with vision and passion. The E-Myth Manager Seminar will revolutionize the way you manage. It will help you take control of your job, your employees, and your life, as you accomplish more than you ever thought possible. E-Myth managers have a clear vision of the future, a focused plan, and the ability to communicate and motivate. Once you acquire these skills, your business or department will soon be running itself. That’s a promise.